This Chippewa Arrow is 14″ long to fit most shadow boxes. 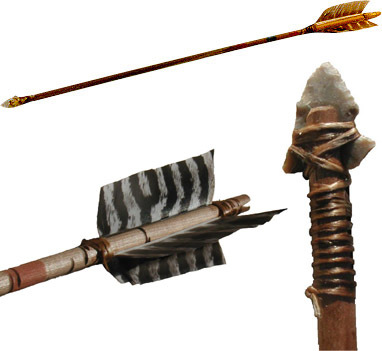 Arrow has stone tip with 3 natural turkey feathers. Stone tip and turkey features are attached to shaft vis sinew wrapping. 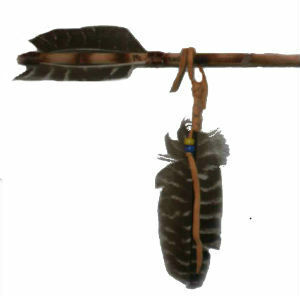 This Chippewa Arrow is 14″ long to fit most shadow box’s. 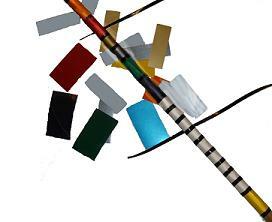 Here in the picture above you see the arrow which has been painted with the cub scout color awards. 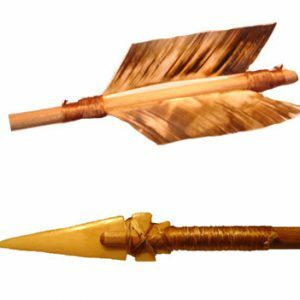 Arrow has stone tip with 3 natural turkey feathers. Stone tip and turkey features are attached to shaft vis sinew wrapping. This Arrow can only support the standard $3.50 tape, or used with paint. Paint does allow for more flexibility with awards but there just isn’t enough room to add very many gold/silver/activity pins plus other additional awards.